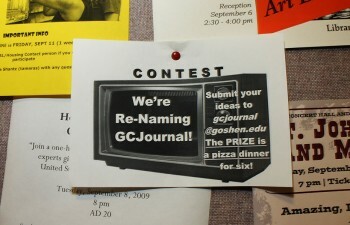 A flier advertising GC Journal's name changing contest. Photo by Anjelica Lehman. When its first episode airs on September 22nd, the bi-weekly student-produced television news broadcast now known as “GC Journal” will have a new name. The broadcasting department, under leadership of new assistant professor of broadcasting Seth Conley, is holding a contest to re-name “GC Journal.” The student with the winning entry will receive a pizza dinner for five friends. “The new name should reflect our goal of moving beyond the four corners of campus while adding a bit of ‘fun and flavor’ to the show,” said Conley. Contest submissions can be emailed to gcjournal@goshen.edu. Taylor Stansberry, a senior, will serve as managing editor this year. Doug Hallman, a senior, is serving as operations manager. “GC Journal” broadcasts live interviews, in-studio performances by student musicians, news features, and other stories reflecting campus life. The hope is to expand coverage by incorporating wider community events this year. The studio set, located in the basement of the library, will be redesigned in the next few weeks to feature a more industrial design of black and silver colors with metallic accents. “GC Journal” is currently available only by webcast through the GC website. However, Conley is working with ITS Media to reinstate broadcast through GC’s cable station, which loops the given episode continuously. According to Stansberry, two main anchors and a sports anchor are chosen each semester to keep the show consistent. Auditions for this year’s anchor positions are being held this afternoon, Thursday, September 10th, at 4 p.m. in the studio. Those interested will be asked to perform a dry read off the station’s teleprompter. Stansberry welcomes any ideas and volunteers for musical groups or artists for in-studio segments.